Q:how many cookies are in each package? A:Each cookie comes individually packed so there is only 1 cookie per package. The minimum order is 12 but you can order any amount above that. 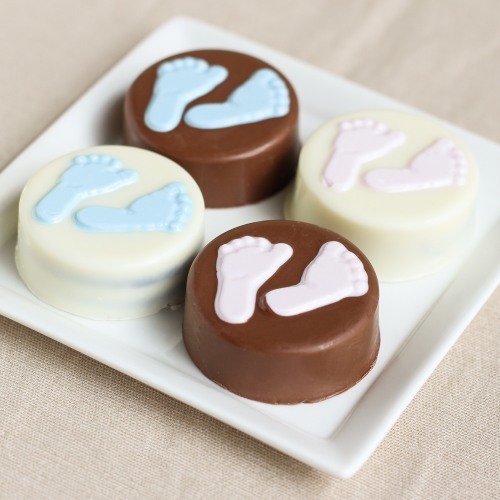 Your bay shower guests won't be able to resist these adorable and delicious baby feet chocolate covered Oreos. Each Oreo is completely covered in either milk or white chocolate and features your choice of pink or blue baby feet. They even come individually wrapped and tied with coordinating ribbon making these treats gift-ready! Please note that this item can only be shipped via 1-Day Shipping for delivery dates between May 1st and September 30th, and 2-Day Shipping the rest of the year. Please note Tuesday deliveries will only be accepted with 1-Day Shipping service. Please select the $15 cooler fee for all orders being delivered between May and September.